Crisp, sparkling and definitive Dom Perignon Champagne is offered in its exclusive gift box that instantly becomes a treasured keepsake when an engraved plaque is added to it. As a business gift, this is a thoughtful and grand gesture for colleagues and clients, or for personal occasions such as congratulating newlyweds, wishing loved ones a happy anniversary, or celebrating any occasion that deserves a monumental gift. One bottle of Dom Perignon Vintage Champagne. For more information on this wine, please see the Tasting Notes. Keepsake Gift Box with Complimentary Engraved Plaque. This fine wine gift is presented in its keepsake gift box. A complimentary card with your personal message or greeting is included with your gift. Free Engraved Plaque! Select one, or two lines of up to 18 characters per line, and we'll engrave your message onto a gold plaque that is securely affixed to the Dom Perignon gift box. Complete the personalization option during checkout. 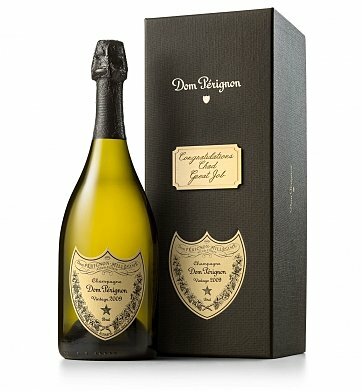 Measures 14" x 5" x 5"
Dom Perignon with Personalized Gift Box is a hand delivered gift. These gifts are delivered by one of our local design centers located throughout the United States and Canada. Same day delivery is available for most gifts when ordered before the cutoff time. The cutoff time for Dom Perignon with Personalized Gift Box is 2 PM in the recipient's time zone. Dom PerignonThe world renowned Champagne produced from only the finest grapes. Powerful, chiseled, and timeless, with notes of almond, powered cocoa, white fruit and hints of dried flowers. One bottle of Dom Perignon Vintage Champagne. One keepsake gift box with complimentary engraved plaque. Includes free card with your personal greeting or message.